All consultations are by appointment only. You may make an appointment to see your doctor or other healthcare professional by presenting at the reception desk or telephoning the surgery on 023 8044 6733. This appointment line is open from 8.00am - 12.00pm and 2.00pm- 6.30pm Monday to Friday. When you call to ask for an appointment our reception team have a triage list of medical conditions, which has been compiled by the GP’s, which will indicate if your symptoms require you to have an appointment with a Practice Nurse, a Nurse Practitioner, a GP or will require a telephone call from a GP and the receptionist can book this for you. We would kindly ask you therefore to let our reception team know the reason you require an appointment so that they may book you with the most appropriate clinician – rest assured that all staff are bound by a code of confidentiality. Routine consultations are 10 minutes and are available for every morning and afternoon per week. 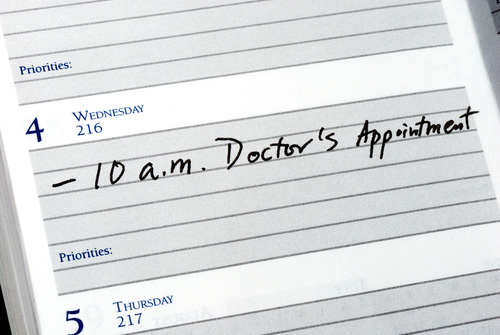 Please make one appointment for each person who wishes to see the doctor. You will be offered the first available appointment time, unless you stress that you have an urgent medical need. True emergency cases are always given priority. If you cannot attend an appointment for any reason please inform us as soon as possible in order for us to give the slot to someone else. Either use system online, if you are registered for this service or telephone or email to cancel your appointment.